Humble Student of the Markets: Should you have sold in May? All it took was someone to whisper "Fed tapering" and volatility has returned with a vengeance to the markets. I explored this topic in late April (see Sell in May?) and outlined various criteria for getting bearish. For now, most of them haven't been met, which means that I am still inclined to give the bull case the benefit of the doubt. Surveying the Big Three global economies (US, Europe and China), I see signs of healing - which suggest that markets are likely to continue to grind higher, albeit in a volatile fashion. Let's take the regions one by one. As I mentioned, I outlined a number of bearish tripwires in my previous post Sell in May? Failure of cyclical sectors to regain their leadership and defensive sectors to outperform. 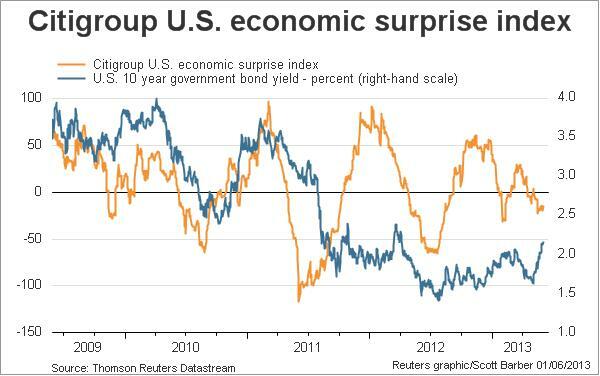 With the exception of high frequency economic release data, none of the aforementioned tripwires have been triggered. 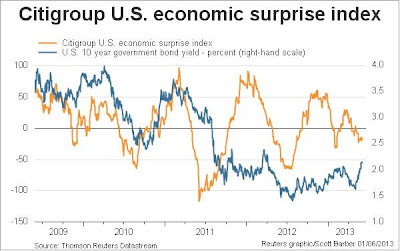 The chart below shows the decline in the Citigroup Economic Surprise Index, but my own personal impression of high frequency economic data is that the results have been mixed. Even then, bad news may be good news as a weakening economy may provide the impetus for the Federal Reserve to delay any tapering of QE-infinity. We will have a major test of market psychology this Friday. Supposing that the Non-Farm Payroll misses expectations, will the markets react positively because it is another data point supportive of further QE, or negatively because employment isn't growing as expected? In the meantime, the major market averages remain in a well-defined uptrend. So why are traders so skittish? 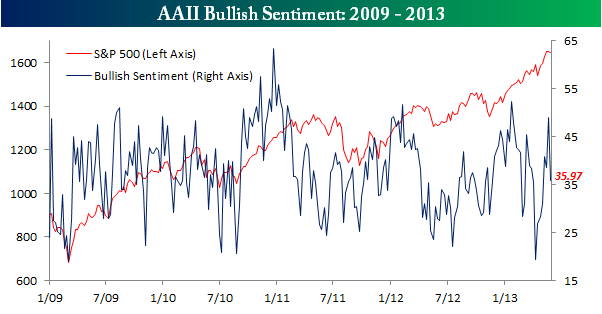 In fact, market participants have been so skittish that it only took a minor decline in the major averages for the percentage of bulls from the AAII survey to tank from a crowded long reading (chart via Bespoke). 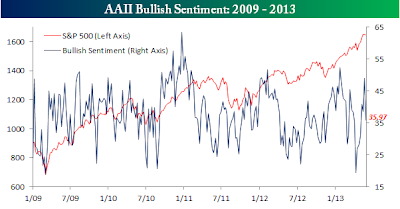 This kind of nervousness do not typically mark major market tops. Meanwhile, cyclical sectors as measured by the Morgan Stanley Cyclical Index have started to turn up against the market. What's more telling is the fact that cyclical sectors performed well in Friday's market selloff. Across the Atlantic, I am seeing signs of healing in Europe (see Europe healing?) What's more important is the fact that eurozone leaders are taking steps beyond pure austerity measures to address their structural problems. The French, German and Italian governments joined forces to launch initiatives to "rescue an entire generation" who fear they will never find jobs. More than 7.5 million young Europeans aged between 15 and 24 are not in employment, education or training, according to EU data. The rate of youth unemployment is more than double that for adults, and more than half of young people in Greece (59%) and Spain (55%) are unemployed. But a new way of thinking has recently taken hold in the German capital. In light of record new unemployment figures among young people, even the intransigent Germans now realize that action is needed. "If we don't act now, we risk losing an entire generation in Southern Europe," say people close to Schäuble. To come to grips with the problem, Merkel and Schäuble are willing to abandon ironclad tenets of their current bailout philosophy. In the future, they intend to provide direct assistance to select crisis-ridden countries instead of waiting for other countries to join in or for the European Commission to take the lead. To do so, they are even willing to send more money from Germany to the troubled regions and incorporate new guarantees into the federal budget. "We want to show that we're not just the world's best savers," says a Schäuble confidant. Last Tuesday, Schäuble sent a letter to Economics Minister Philipp Rösler in which he proposed that the coalition partners act together. "I believe that we should also offer bilateral German aid," he wrote, noting that he hoped that this approach would result in "significant faster-acting support with visible and psychologically effective results within a foreseeable time period." Schäuble needs Rösler's cooperation because the finance and economics ministries are jointly responsible for the government-owned KfW development bank. The Frankfurt-based institution is to play a key role in the German growth concept that experts from both ministries have started drafting for Spain. Spanish companies suffer from the fact that the country's banks are currently lending at only relatively high interest rates. But since it is owned by the German government, the KfW can borrow money at rates almost as low as the government itself. Under the Berlin plan, the KfW would pass on part of this benefit to the ailing Spanish economy. This is how the plan is supposed to work: First, the KfW would issue a so-called global loan to its Spanish sister bank, the ICO. These funds would then enable the Spanish development bank to offer lower-interest loans to domestic companies. As a result, Spanish companies would be able to benefit from low interest rates available in Germany. Now that they are taking steps to clean out the deadwood, the next thing to do is to plant, i.e. directly address the youth unemployment problem. These are all positive structural steps and, if properly implemented, result in a new sustainable growth model for Europe. The bear case for China is this: The leadership recognizes that the model of relying on infrastructure spending and exports to fuel growth is unsustainable. It is trying to wean the economy off that growth path and shift it to one fueled by the Chinese consumer. Moreover, it has made it clear that given a choice between growth and financial stability, the government will choose the latter. This was a signal that we shouldn't expect a knee-jerk response of more stimulus programs should economic growth start to slow down. China’s manufacturing unexpectedly accelerated in May, indicating that a slowdown in economic growth in the first quarter may be stabilizing. The Purchasing Managers’ Index rose to 50.8 from 50.6 in April, the National Bureau of Statistics and China Federation of Logistics and Purchasing said in Beijing yesterday. That was higher than all estimates in a Bloomberg News survey of 30 analysts and compares with the median projection of 50, which marks the dividing line between expansion and contraction. Other indirect indicators of Chinese demand such as commodity prices are stabilizaing. Dr. Copper rallied out of a downtrend and appears to be undergoing a period of sideways consolidation. US macro surprise: If we get an ugly NFP this Friday and further signs that US macro picture is slowing, it will negatively affect the earnings outlook and deflate stock prices. The rise in JGB volatility is raising concerns about a volatility-induced selloff similar to the so called “VaR shock” of the summer of 2003. 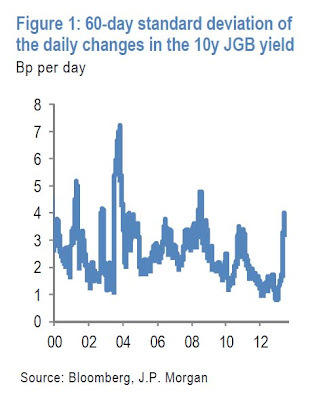 At the time, the 10y JGB yield tripled from 0.5% in June 2003 to 1.6% in September 2003. The 60-day standard deviation of the daily changes in the 10y JGB yield jumped from 2bp per day to more than 7bp per day over the same period. As documented widely in the literature, the sharp rise in market volatility in the summer of 2003 induced Japanese banks to sell government bonds as the Value-at-Risk exceeded their limits. This volatility induced selloff became self-reinforcing until yields rose to a level that induced buying by VaR insensitive investors. An emerging market blowup and subsequent financial contagion: The hints of Fed tapering have negatively affected the emerging market bond market and they are starting to roll over against Treasuries. I am monitoring this chart of emerging market bonds against 7-10 Treasuries carefully for signs of market stress and contagion. The Short Side of Long has indicated that, in general, sentiment towards equities remain at frothy levels which suggests that a short-term pullback may be in order, However, I am still inclined to stay long equities on an intermediate term basis and give the bulls the benefit of the doubt, but at the same time watching over my shoulder for signs of trouble. I think our friend peter brandt would be licking his chops over the h and s looking top on the last chart. re: europe, looks like they're throwing more money at it. nothing else. drahgi saying they need structural reform does not equal structural reform. idea for cam: ratio charts of hyg and jnk ovr ief and tlt may be some of the first hints that things will go wrong here.